Here's why milk traders want police protection ahead of a new Tamil movie release. 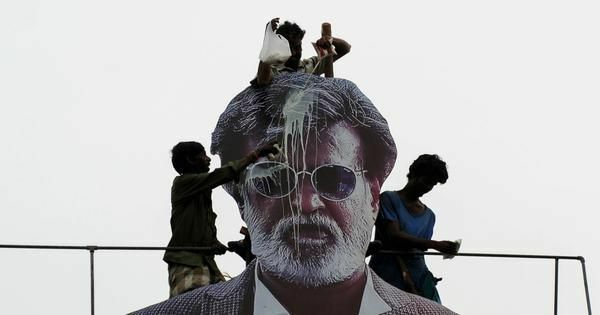 The Tamil Nadu Milk Dealers Employees Welfare Association has filed a complaint with the state police against fans stealing milk from outlets and pouring it on giant cut-outs of movie stars to celebrate new releases, The Indian Express reported on Thursday. The association has demanded a ban on “paal abishekam”, or the practice of pouring milk on actors’ cutouts and banners, saying it leads to unnecessary wastage of milk. The association has also sought police protection outside milk dealers’ shops and distribution centres on the day of movie releases. The organisation wrote to the Chennai Police commissioner a day after Tamil actor Simbu shared a video urging fans to celebrate the release of his movie, Vantha Rajavathaan Varuven, by generously pouring milk on his posters. It is scheduled to be released on February 1. Ponnusamy claimed that the police often refuse to investigate such incidents since a case can only be registered if the theft takes place inside a shop. “Since they [fans] steal milk boxes kept outside, they [the police] are helpless, it seems,” he added. The association also urged the police to take action against Simbu, claiming his request to fans might lead to law and order problems, The News Minute reported. “By instigating his fans to celebrate in this manner, Simbu’s request might aggravate other stars’ fans, thereby resulting in a clash between factions,” it added. He could have handled it in a better way, in the age of social media trolling is the new cool, they will troll you for every damn thing. Who's not getting trolled from Salman to Rajini to Pawan to Sudeep to even Vivek. You are a star, so you have to control your emotions. Every single day people troll Salman for that hit n run case, harassment, black buck case and all, it doesn't mean he will come out and bash all his naysayers. You need to see why he made that video. He was among the first actor to strictly dictate his fans to not waste a single drop of milk or single rupee on such cut outs. Instead he had asked them to spend that time & money with parents. He was attacked by trolls. As an answer to them he made that video saying "As trolls said he has only 3 or 4 fans, so requesting those 3 or 4 fans to celebrate his film release in a big way." 'Is this fandom? ': Why Yash's reaction to his fan's suicide is important. Over the top Viswasam celebrations go wrong. Massive Thala Ajith cut out crashes injuring the fans. Vikram-Madhavan-Prithviraj to Appear in Tamil Remake of 'Zindagi Na Milegi Dobara'. Views?